Original Editors - Adam Hooten & Andrew Stethen from Bellarmine University's Pathophysiology of Complex Patient Problems project. The thyroid gland regulates hormones in the body that control heart rate, blood pressure, weight, and body temperature. Thyroid cancer forms in the thyroid gland and is broken down into four main types: papillary, follicular, medullary, and anaplastic. Papillary thyroid cancer is the most common type and grows slowly in the follicular cells. Follicular thyroid cancer is slightly less common but also grows slowly in the follicular cells. Both forms look similar to normal thyroid tissue under a microscope and account for over 90% of all thyroid cancers. These two forms are often curable when found under the age of 45. Medullary thyroid cancer develops in the C cells and is sometimes the result of a genetic syndrome. 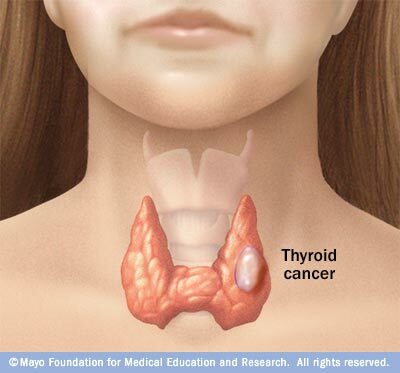 This cancer does not resemble normal thyroid tissue and accounts for almost 5% of thyroid cancers. This type can be controlled if it is diagnosed before metastasis. The anaplastic form of thyroid cancer is the least common at 2%, but it is fast growing and harder to treat. Staging your cancer is the process of finding out if and how far a cancer has spread. The stage of a cancer is one of the most important factors in choosing treatment options and predicting your prognosis. N describes the extent of spread to nearby (regional) lymph nodes. Lymph nodes are bean-shaped collections of immune system cells to which cancers often spread first. Cells from thyroid cancers can travel to lymph nodes in the neck and chest areas. Numbers or letters appear after T, N, and M to provide more details about each of these factors. The numbers 0 through 4 indicate increasing severity. The letter X means a category can’t be assessed because the information is not available. Estimated new cases in the United States in 2014: 62,980 (47,790 in women and 15,190 in men). Estimated deaths in the United States in 2014: 1,890 (1,060 women and 830 men). An associated co-morbidity is a disorder or disease that predisposes a person to develop thyroid cancer. About 1 out of 3 medullary thyroid carcinomas (MTCs) result from inheriting an abnormal gene. These cases are known as familial medullary thyroid carcinoma (FMTC). The combination of FMTC and tumors of other endocrine glands is called multiple endocrine neoplasia type 2 (MEN 2). There are 2 subtypes, MEN 2a and MEN 2b, both of which are caused by mutations in a gene called RET. Carney complex, type I: Can cause an increased risk of papillary or follicular thyroid cancers. Familial nonmedullary thyroid carcinoma: Thyroid cancer occurs more often in some families, and is often seen at an earlier age. The most common form of thyroid cancer that runs in these families is the papillary type. Genes on chromosome 19 and chromosome 1 are suspected of causing these familial cancers. Family history: Having a first-degree relative (parent or sibling) with thyroid cancer, even without a known inherited syndrome in the family, increases your risk of thyroid cancer. The genetic basis for these cancers is not totally clear. Bone pain is often the first symptom. Pain is worse at night and is better with movement. RAI is used for follicular and papillary thyroid cancers. 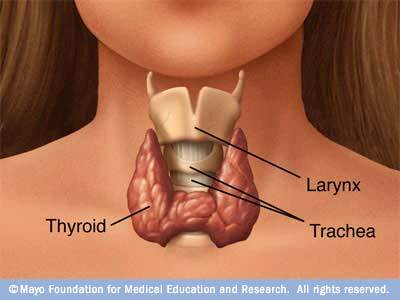 This is taken by mouth and will collect any remaining thyroid cancer cells that may have spread. Since only the thyroid gland takes up iodine, no other tissue is harmed. Radiation uses high energy x-rays to kill cancer cells and keep them from growing (depends on stage and type of cancer). Uses drugs (by mouth or injection) to stop the growth of cancer cells. (Depends on type and stage of cancer). Hormone therapy removes hormones or blocks their action to stop cancer cells from growing. For thyroid cancer, drugs are given to prevent the body from making Thyroid-stimulating hormone (TSH) because this hormone increases the chance that the thyroid cancer will grow or recur. Kainuma K, Kitoh R, Yoshimura H, Usami S. The first report of bilateral retropharyngeal lymph node metastasis from papillary thyroid carcinoma and review of the literature. Acta Oto-Laryngologica [serial online]. December 2011;131(12):1341-1348. ↑ 1.0 1.1 1.2 Riverside. Thyroid Cancer.http://www.riversideonline.com/health_reference/Cancer/DS00492.cfm. Updated April 2, 2011. Accessed March 25, 2014. ↑ 2.0 2.1 National Cancer Institute. Thyroid Cancer. http://www.cancer.gov/cancertopics/types/thyroid. Accessed March 6, 2014. ↑ 3.0 3.1 3.2 3.3 American Society of Clinical Oncology. Thyroid Cancer. http://www.cancer.net/cancer-types/thyroid-cancer. Reviewed 7/2013. Accessed March 6, 2014. ↑ 4.0 4.1 4.2 American Cancer Society. How is Thyroid Cancer Staged?http://www.cancer.org/cancer/thyroidcancer/detailedguide/thyroid-cancer-staging. Revised March 20, 2014. Accessed March 25, 2014. ↑ 5.0 5.1 5.2 5.3 American Cancer Society. Thyroid Cancer. http://www.cancer.org/acs/groups/cid/documents/webcontent/003144-pdf.pdf. Updated March 20, 2014. Accessed March 25, 2014. ↑ 6.0 6.1 6.2 6.3 American Thyroid Association. Thyroid Cancer. http://www.thyroid.org/cancer-of-the-thyroid-gland/. Accessed March 20, 2014. ↑ National Cancer Institute. Thyroid Cancer. http://www.cancer.gov/cancertopics/druginfo/thyroidcancer. Accessed March 20, 2014. ↑ National Cancer Institute. Metastatic Cancer. http://www.cancer.gov/cancertopics/factsheet/Sites-Types/metastatic. Updated March 28, 2013. Accessed March 25, 2014. ↑ Burke, D. Healthline. Metastatic Lung Cancer. http://www.healthline.com/health/metastatic-cancer-to-the-lung. Published June 25, 2012. Accessed March 6, 2014. ↑ Rice, S.C. Healthline. Liver Metastasis. http://www.healthline.com/health/liver-metastases. Accessed March 6, 2014.